Scores of young transgenic American chestnut trees developed at ESF will take root this spring across New York state, representing one more step in the restoration of a once-dominant species that has virtually vanished from the landscape. Spindly "plantlets" about a foot high will settle into the ground under a U.S. Department of Agriculture (USDA) permit in Central, Western, and downstate New York, locations where their growth will be controlled and monitored as the newly developed strains undergo a rigorous federal approval process. "It's just one more step toward the restoration," said Dr. William Powell, co-director of the American chestnut restoration project at ESF. 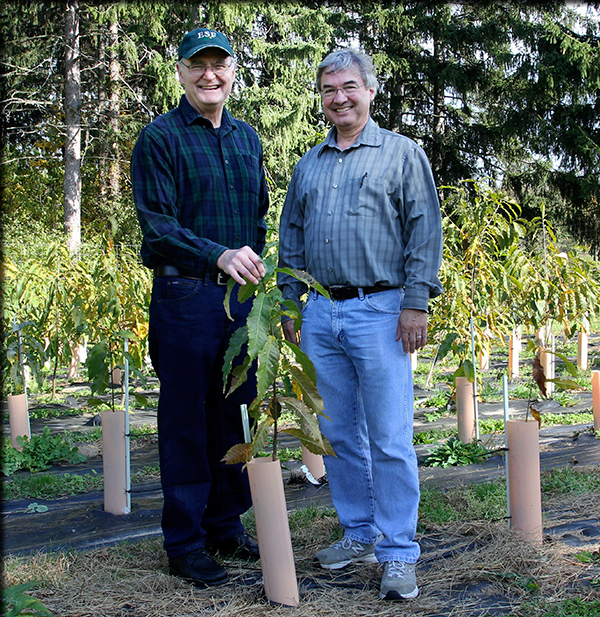 "The ultimate goal is to bring back the American chestnut tree." Trees will be planted on ESF property in the Syracuse area, at a site in the Zoar Valley of Western New York under the direction of the New York chapter of The American Chestnut Foundation (TACFNY), and in Westchester County on property owned by the historic Camp Fire Club. "TACFNY has been helping to support the ESF chestnut project for 25 years. We couldn't have done it without them," said Powell's co-director on the project, Dr. Charles Maynard, also of ESF. Members of the Camp Fire Club, a 118-year-old organization of outdoorsmen and conservationists, organized a planting on their land to both support restoration efforts and teach youth about the value of connecting with nature. "We wanted to help provide a test site and have a youth education day," said Preston Bruenn, the club's Conservation Committee chairman who is also an ESF alumnus (ES) from the Class of 1986. "The members of this club have such a connection to the American chestnut tree. Our main lodge was constructed from American chestnut in the early 1900s. As soon as they heard there was a chance to help in the restoration process for the species, they jumped at it." Powell, Maynard and their research team have developed new strains of American chestnut that can withstand the invasive blight that killed billions of the trees in the early 20th century. The scientists added a single gene from wheat to the tree's genome; the additional gene allows the tree to detoxify the oxalic acid produced by the invasive fungus. Lab tests show that subsequent generations of trees are also blight resistant and produce gluten-free chestnuts. The trees being planted this spring have been nurtured so far in ESF greenhouses. Because the transgenic trees have not yet been through the full approval process, their growth must be monitored, the planting sites must be available for inspection and the research team must ensure they do not reproduce yet. Powell said the trees are too young now to reproduce. He hopes that by the time they are old enough, which is likely to take at least seven years, the necessary approvals will have been granted by the USDA, Environmental Protection Agency and Food and Drug Administration. Between 12 and 18 trees will be planted at each location this spring along with a similar number wild-type "mother" trees. The mother trees are not blight-resistant but they can eventually breed with the transgenic ones to produce a new generation of blight-resistant trees with increased genetic diversity. "We can plant more trees over time," Bruenn said. "We wanted to help supply a test site and, internally, we wanted to do it as a youth education day. The kids will be out here planting with us. We hope it will help instill a conservation ethic in the kids early on." For Powell, the chestnut project has long been focused on the children who will grow up to see these trees mature. "It's for future generations. They are the ones who are going to see the trees come back," he said. "The kids who are helping with this project now can come back in 50 years with their grandchildren and say, 'I planted these trees.'"